and 1/2 mile from the iconic Ribblehead Viaduct. and families wanting to enjoy a break in the beautiful Yorkshire Dales. This warm,comfortable bunk barn sleeps up to 12/13 people in 3 bunk rooms. 1x family(en suite room) room with double bed plus 3 x single bed spaces. 2x further bunk rooms each sleeping 4 people. Friday - Saturday: Minimum 2 night stay with sole use of the barn. Sunday - Thursday: Individual bunk rooms are available for sole use. 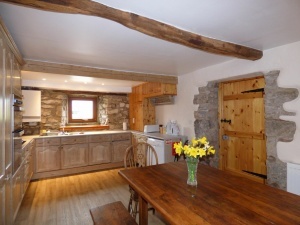 Large well equipped self catering kitchen/diner with large farmhouse table. Main bathroom downstairs with shower over bath. Self service breakfast available by arrangement. Fitted sheets,pillows and pillowcases are provided. Duvets and towels are available to hire. 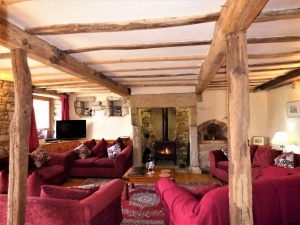 Situated next to Gauber Bunk Barn, The Den offers cosy,quirky accommodation for up to 4 people. The self contained Den can be booked for sole use or in addition to the bunk barn. From Settle take the B6479 (Horton-in-Ribblesdale). From Selside pass Salt Lake Railway cottages(on the left). Gauber Farmhouse (white gable walls) and bunk barn can be seen just down the road on the right hand side. 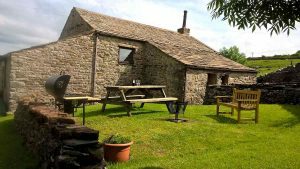 We are a 15 minute walk from Ribblehead Train Station.